A factory in England during the Industrial Revolution. Have you read or seen Oliver Twist? What about A Christmas Carol? Even if you haven't you've probably heard of Scrooge. Those stories were written in Victorian England. Have you heard of Queen Victoria? Until Elizabeth II, she was the longest serving British monarch (king or queen) in history. "Victorian" means they came from the time she was Queen. 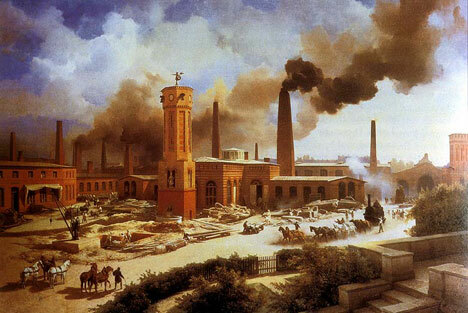 The Victorian era in Britain came in the middle of what's called the Industrial Revolution. This was the event in history which transformed Britain (and some of Europe) from the feudal system which has stayed since the Middle Ages to the kind of society we would recognise now: big towns and cities, people working in factories, machines making jobs easier... this all began with the Industrial Revolution. Your study of the Industrial Revolution is divided in two: First you study Industrial England, where you learn about the new inventions and developments. The second is Rural Ireland, which didn't have an Industrial Revolution and whose people remained either on farms or in poverty. The Great Famine struck there during Queen Victoria's reign, and that is the last topic you learn about in Second Year History. Once you start Third Year, it's on to Ireland's attempts to gain independence from Britain, something many people wanted after the devastation of the Famine.